A friend sent me an urgent email the other day. He re-sent the original link. I saw his point, and went out to buy a watermelon. I think that we’ve amply covered the charms of adding feta, mint, and lime to summer salads (maybe as recently as yesterday, in fact). But, at the risk of being repetitive, today we’re one-upping that trifecta by introducing it to a sweet and juicy watermelon. I made this as a layered green salad: lettuce, watermelon, feta, and mint all drenched in lime. But you can omit the greens and have a perfectly lovely salad. Slivers of red onion are good here if you’re in the mood, and you can take the flavor in other directions by varying the herbs. 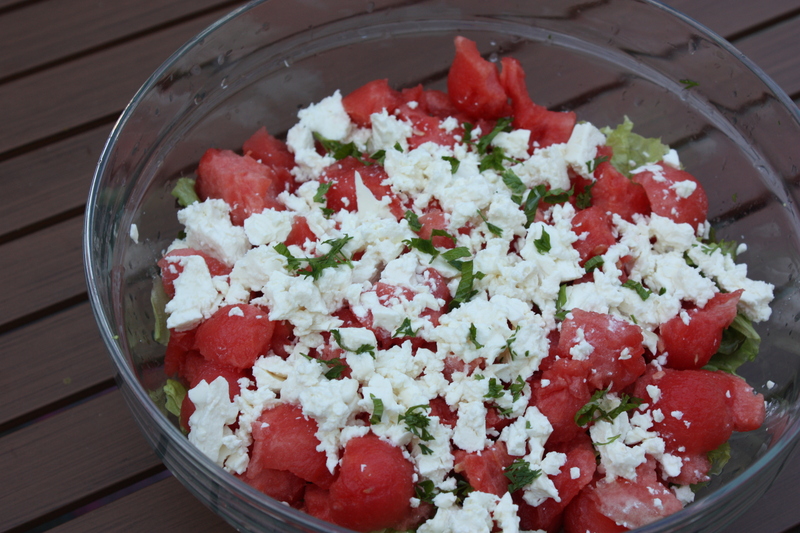 The non-negotiable elements are watermelon, feta, lime, and a picnic table. Green Salad with Watermelon, Feta, and Mint: Wash and tear a head of lettuce and heap into a salad bowl. Top with diced watermelon (or get fancy with your melon baller if you have one). Crumble feta all over the melon, then sprinkle with a generous handful of slivered mint. Squeeze a big juicy lime all over the salad and serve immediately. All of the individual ingredients can be prepared in advance, but wait until the last minute to assemble the salad (so the salt from the feta doesn’t make your bowl fill up with watermelon juice). 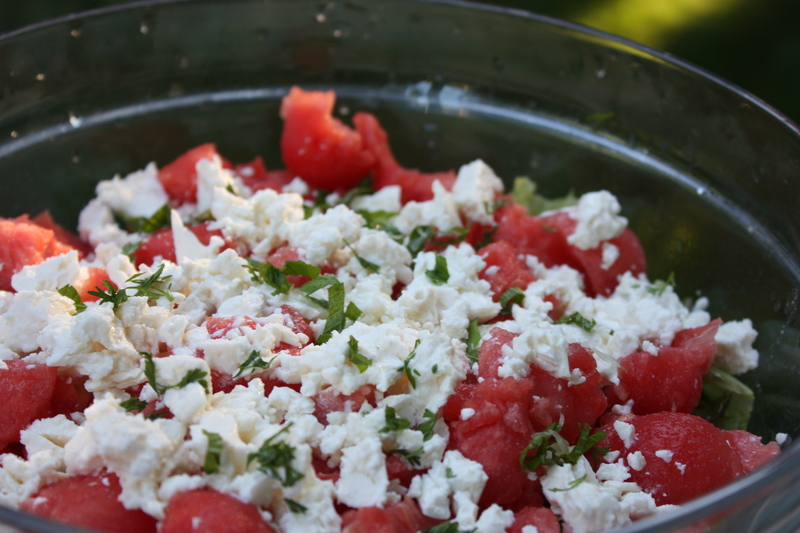 This entry was posted in Easily Multiplies to Feed a Crowd, Food, Fruit, Recipes, Salads and tagged feta, fruit-y salad, green salad, salad, summer recipes, summer salad, watermelon on August 19, 2012 by emmycooks. This is one of my absolute favourite summer salads! This is what my watermelon has been waiting for … Thank you! I don’t normally love watermelon but I am curious about these flavors together. I made a similar version of this over the weekend using Parmesean Cheese instead of Feta and lemon juice instead of Feta but my guests enjoyed a different way of consuming watermelon. Love your picture too. This is one of my favorite combinations! I use tomato in mine…. Oh to find a substitute for feta. This combo is killing me (in a mouth watery, I want that kind of way). Thanks for sharing! I remember eating this salad at a friend’s some years ago, and being surprised at how good it was despite having both feta and watermelon (two ingredients that I don’t use often). I’ve mentioned this salad before, but it’s good for a last taste of summer before the best of the watermelons are gone. Enjoy!